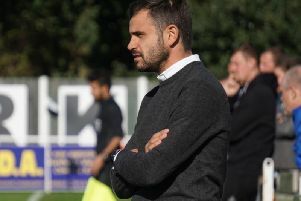 Delighted Worksop Town boss Craig Denton praised his players after their quickfire start demolished Athersley Recreation. Two goals in the first three minutes, followed by another nine minutes later, effectively won the points. The Tigers made it 4-0 before half-time and were able to relax in the second period, although they could still have added to their goal tally against the visitors, who by then had been reduced to 210 men. Denton said: “We were excellent in the first half and came out the traps nice and bright and on the front foot. “We were looking for that reaction (from the previous match). “We got the ball into good areas and reaped our rewards — but the second half was disappointing. Steve McDonnell set up Craig Mitchell to poke in the first-minute breakthrough before McDonnell turned from goal provider to goalscorer when he scored from the rebound off one of his shots. When Steven Woolley’s free kick was handled Kyle Jordan made it 3-0 from the penalty spot. In the 23rd minute Dale Bettoner was dismissed for a foul on McDonnell and the Tigers took full advantage seven minutes before half-time as Sykes raced through on to Woolley’s ball over the top to score. Athersley pulled a goal back through Kieran Scargill 10 minutes into the second period.